Last night's show took the Meek Mill "beef" to all-out tactical assault. Meek Mill has been taking so many Ls in the court of public opinion over the past few weeks that it’s hard not to feel sorry for him. By now you’ve all heard the story: Meek accused Drake on Twitter of using ghostwriters for his verses, Drake responded with two tracks—“Charged Up” and “Back to Back”—and when Meek finally hit back with his own track, it fell flat. It’s difficult to say whether or not Meek deserves the heat that’s been thrown at him. Maybe he was right to call Drake out; maybe he wasn’t. If anything’s certain though, it’s that Drake’s OVO team are sending out the message that unless you can annihilate Drake bar for bar—like Jay Z on the “We Made It” remix last year, or Pusha T on songs like "Exodus 23:1"—then the force of October's Very Own will punch down. The Drake-Meek Mill beef has escalated to all-out tactical assauly, and that became all the more evident at Drake's closing OVO Fest show last night. Drake took no time to mention the beef, opening his set with “Charged Up” and “Back to Back”. If that wasn’t enough, the performance featured a backing slideshow packed with Meek Mill memes. 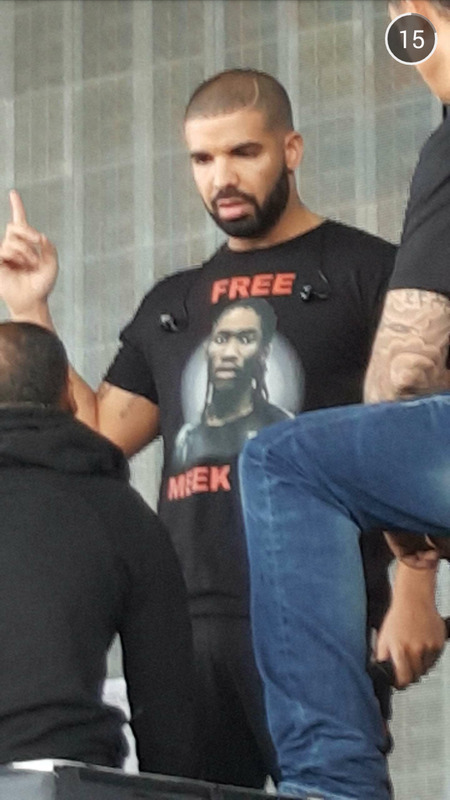 Drake also wore a vintage Free Meek Mill T-shirt. A clip has also emerged of Kanye, Will Smith and Drake laughing over footage filmed on Will Smith’s phone. “That’s the Meek one”, Kanye says, laughing, giving us ample reason to assume the footage on Will Smith’s phone features yet another Meek Mill meme. A moment in the set also suggested that Drake isn’t finished, as he dropped a “3Peat” bar referencing a rumored third track—reportedly produced by Vinylz, Boi-1da, Detail and 40—that's waiting in the wings. Unfortunately though, the night ended on a much more serious note. Billboard reported that two people have been killed, and three injured in a shooting inside the official OVO Fest afterparty, which was hosted by Drake. You can follow Ryan Bassil on Twitter.